This kit for a dozen includes 12 Tonkin cane bamboo shafts (more info below), 36 full length left wing turkey feathers (your choice of fletching colour black, lt/drk brown, grey, white, red, green, blue, yellow, purple, orange), 12 field points, tube of ducco fletching glue. Tonkin Cane bamboo shafting. Comes straightened, heat treated, and sealed. This is the bamboo used for millenia by the Huns and Mongols. Fibres run the length of the bamboo, through the low profile nodes. This gives the best strength to weight ratio. Sets are available in 5lb. increments to match the weight of your bow. They are matched weight, 33" in length. 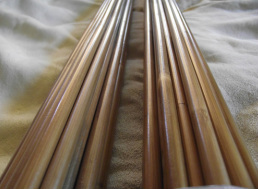 Bamboo shafts are our preferred choice in shafting.